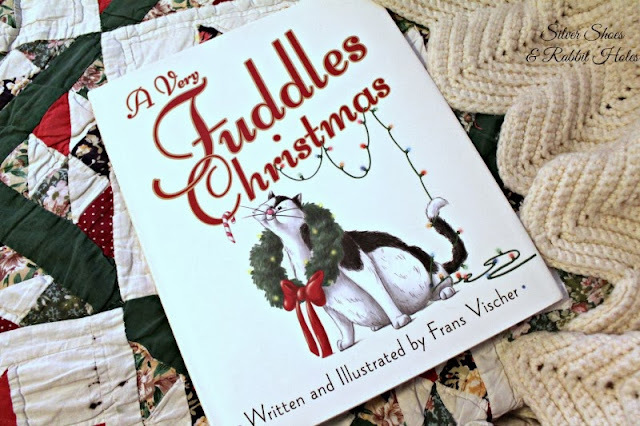 A Very Fuddles Christmas by Frans Vischer. Aladdin, 2013. We have cats. As of this particular post, we have four. Did I set out to have four kitties? NO. Mabel, our chirpy, talkative tortoiseshell, moved herself in as a sick kitten last winter, and her sister Lucy, the last of our fluffy feral porch cats, finally decided to move in this month. Poor old Katie and Jenny. They're 16 and nearly 15, respectively, and not in the mood for these young'ns. I joke that my kitties are spoiled. Mabel has become quite fat pleasingly plump since she came to us. 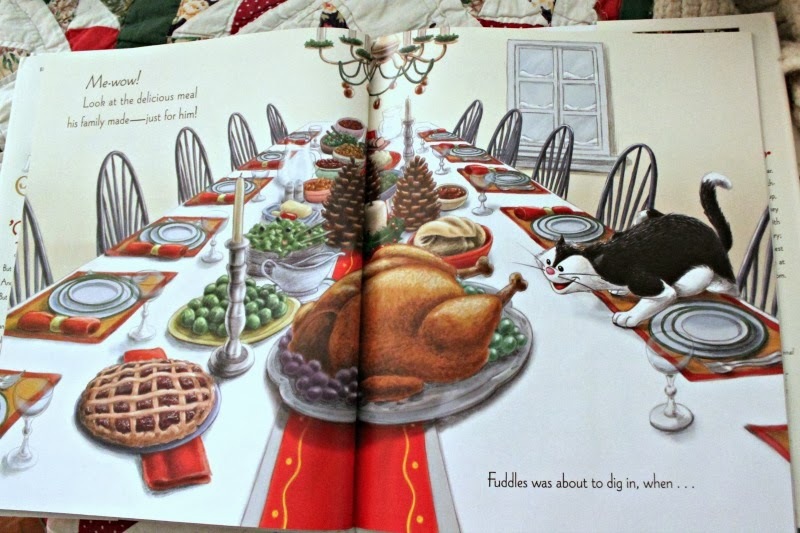 But even Miss Mabel has nothing on Fuddles. I received an email from Frans Vischer, asking if I would be interested in reviewing his new book. A book about a fat, spoiled kitty? Of course I said yes! I even ran to the library and grabbed the first Fuddles book. Fuddles is an awesomely spoiled, chubby tuxedo kitty. 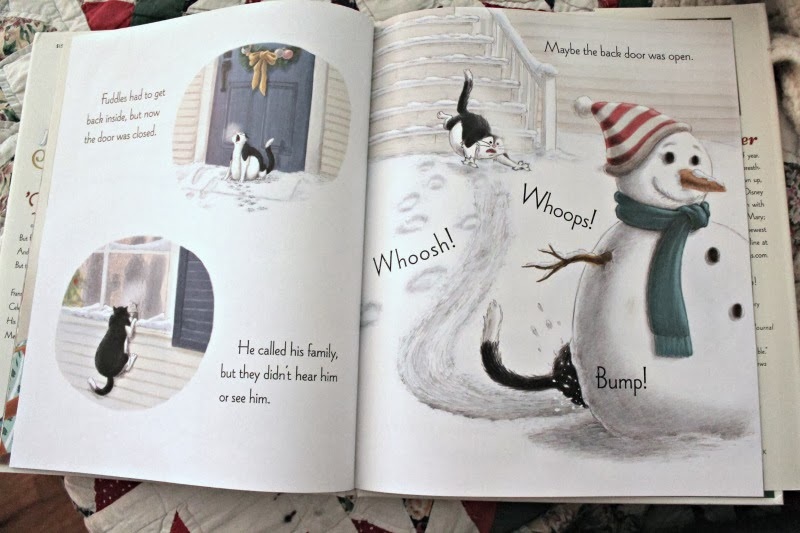 The first book is all about Fuddles' attempts to go outside - he's an indoor kitty - and the scrapes he gets into when he finally gets his wish. 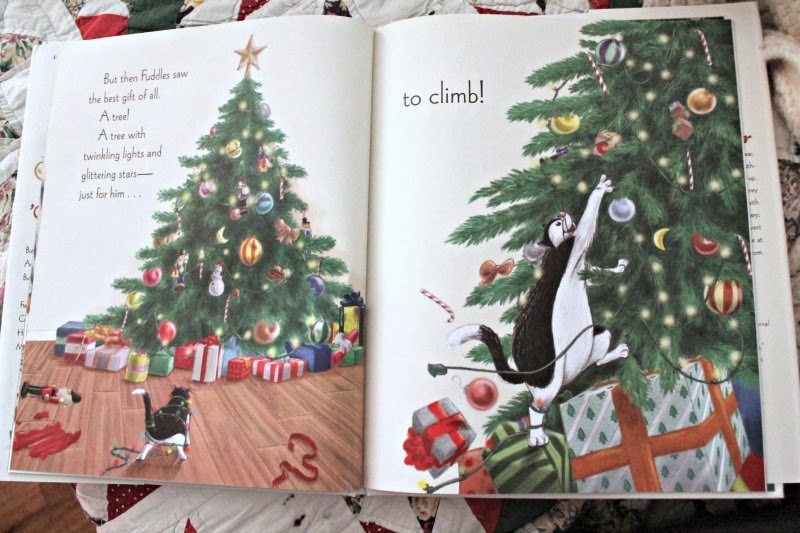 Well, let's just say Fuddles gets back into the house in fine, Christmasy fashion. 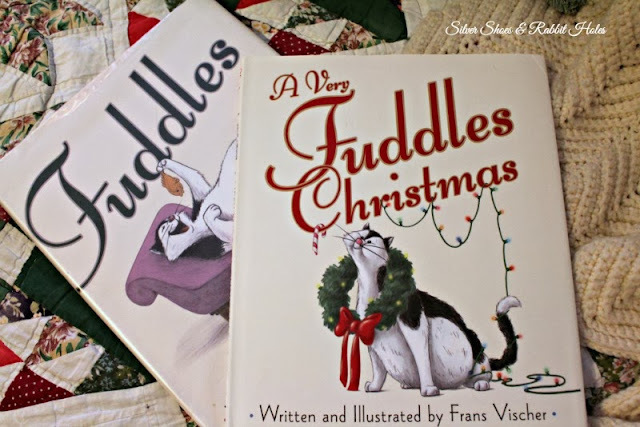 Fuddles may be a new favorite character around the house. Big Sis, my favorite 8-year-old review buddy, wanted to help me with this review, as winter break began today. 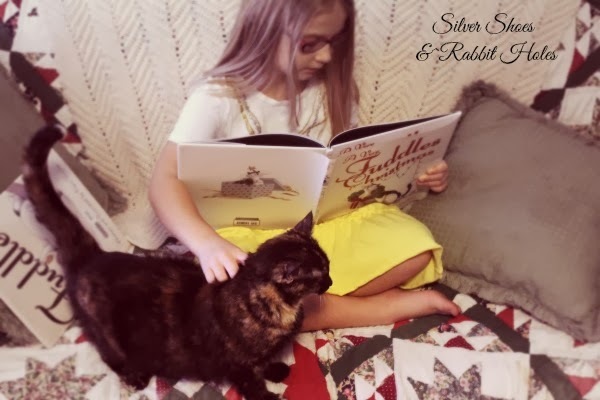 She re-read the book, with a little "help." Mabel knows just when to get in the way. 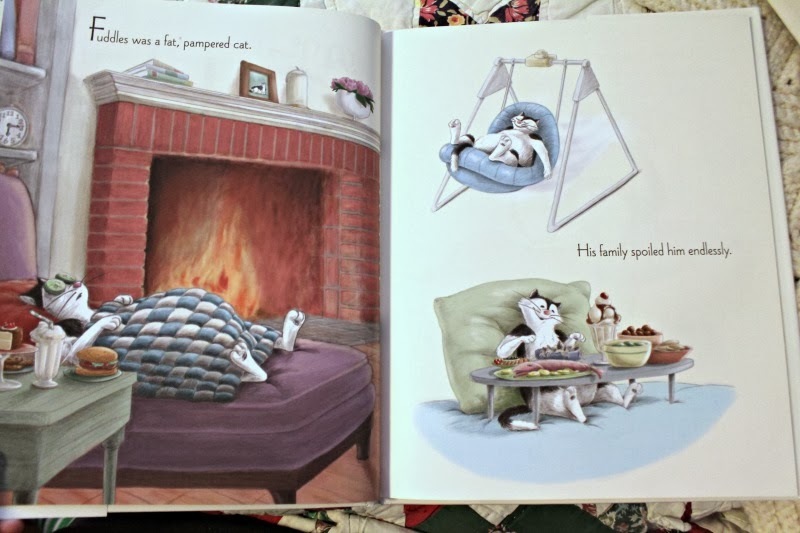 "I think he thinks like a real cat would." "I like his facial expressions." I totally agree with Big Sis. This is a wonderfully expressive animal. 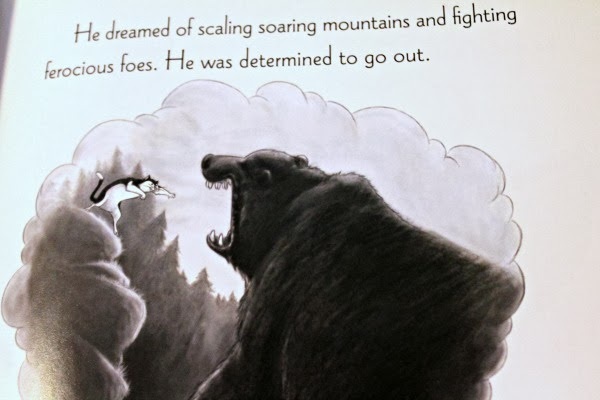 (Considering the author-illustrator is also a Disney animator, one should expect no less!) His thoughts really do seem plausible to a kitty cat. Hilariously so, in fact. 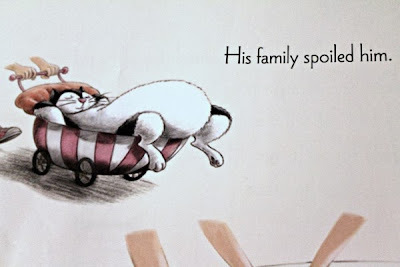 I know my cats think their entire world revolves around them, and that Mr. B, the girls, and I are merely there to feed them, pet them, and change their litter box. 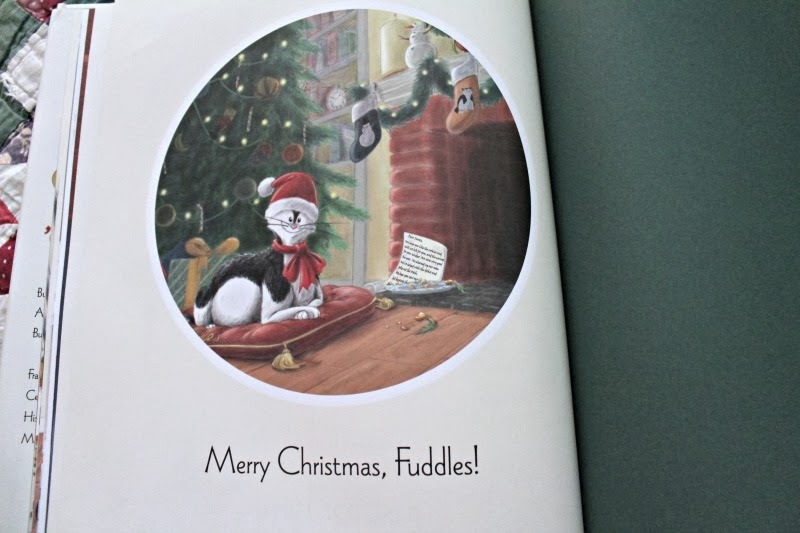 I look forward to more adventures with Fuddles! Thank you, Mr. Vischer, for asking us to review your book! Our copy was provided by the publisher, but all opinions expressed here are completely my own - or Big Sis's own. oh what a mischevious and lucky kitty! This is why our kitty lives outside, hahaha! My little toddler Baby Whimsy adores cats. We don't have one but she loves them all the same. Oh, meows, how cute! I think Big Sis called think "kikis" when she was tiny, if I remember right. "Kiki! Kiki!" Jenny, my old cat who isn't Siamese, would come running. They became inseparable. We have a cat called Oliver, the baby loves him! She tries to grab him all the time-he keeps avoiding her. Haha! I like tabletop trees myself. Very Old World. ;) My girls have never been that fascinated by the cats. It was Jenny who decided she liked little ones. They're warm, for one thing. She likes to snuggle the girls in their sleep. She's started to show her age the past couple of years, but she used to follow them around everywhere.